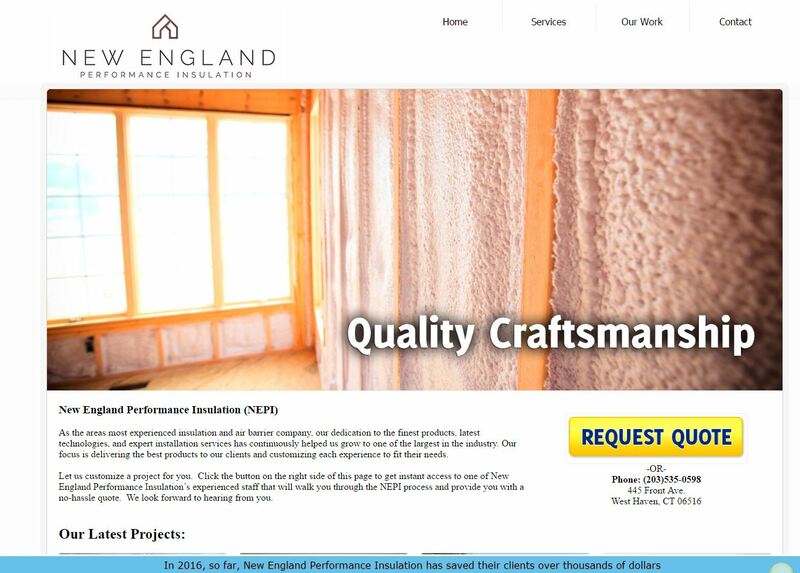 New England Performance Insulation (NEPI) Foam, an insulation installation company based out of Milford, CT, came to 3PRIME in need of a website rebuild as they wanted to update their existing website to a more modern and contemporary look and experience for visitors. NEPI Foam prides itself on using only the highest grade materials and techniques for each and every job and wanted a website that would reflect their vision. 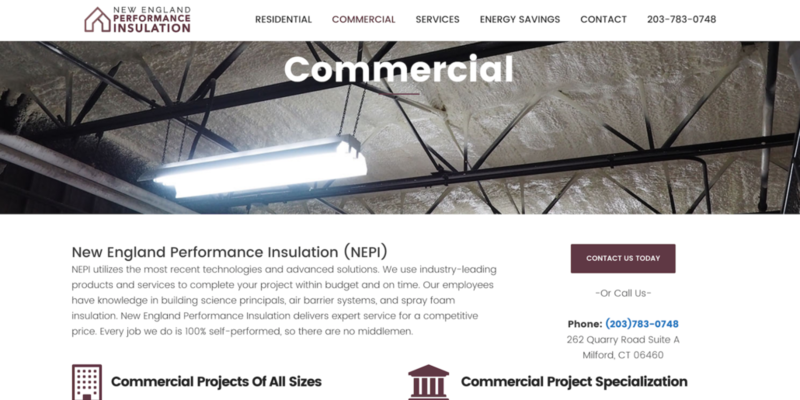 3PRIME worked with NEPI Foam to create a web experience that is indicative of the company’s goals and mission to provide the best in spray foam and insulation available. 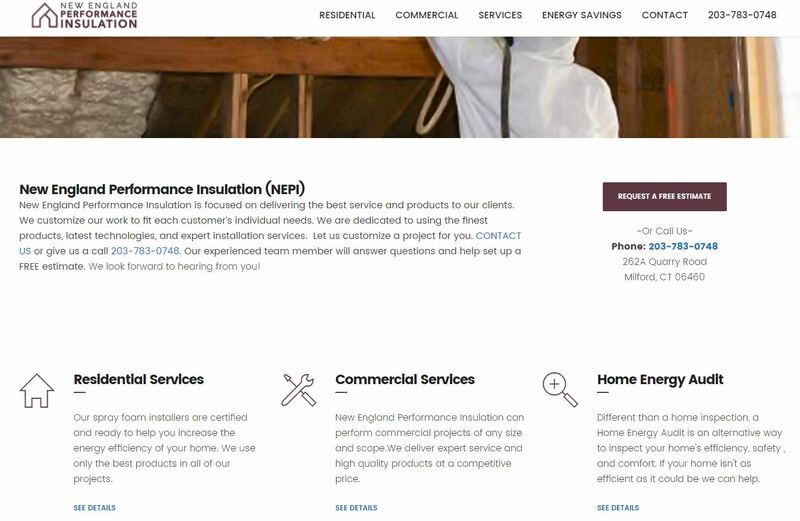 With NEPI Foam being at the forefront of their industry they wanted a web design that would not only showcase their expertise but also educate their customers on the value of upgrading and insulating their homes and businesses. In order to create a website that highlighted NEPI Foam’s expertise and high standards, 3PRIME worked closely with them throughout the design and creation of the updated website. The combination of knowledge and experience throughout the collaborative effort was instrumental in creating a brand new, user-friendly site for NEPI Foam. Since the old site had an outdated feel and design to it, NEPI Foam and 3PRIME worked closely to decipher what the most important and vital aspects of the business were and how best to highlight those to new and returning customers. The result was a move from a dated website to a new and modern designed web experience. Using a premium WordPress theme 3PRIME designed and rebuilt the new website from the ground up. Focused on user experience as well as SEO best practices, the site is a reflection of the quality work that NEPI Foam prides itself on. The mobile experience is accounted for in all 3PRIME web designs and the NEPI Foam site was built using a responsive platform. 3PRIME worked closely with NEPI Foam to understand and advise on how to best present their brand to their customers. In addition to copy assistance and design best practices, 3PRIME also created a website with user experience in mind and that best showcased the quality of NEPI Foam’s materials and work. 3PRIME also installed Google Analytics on the new website to better help NEPI Foam understand their web visitors and create more business opportunities. Tracking and analyzing website data is critical for improving a website, increasing organic rankings, and understanding visitor traffic. 3PRIME also set up a goal tracking system in order for NEPI Foam to understand how their customers are using the website and as a way in which to make positive changes in the future. 3PRIME designs all websites with the goals of their partners in mind. NEPI Foam came to 3PRIME knowing that they needed to both update their website as well as increase their online presence while differentiating from their competitors. Throughout the process 3PRIME and NEPI Foam worked together to create a web experience and design that would not only be more intuitive but also accurately reflect NEPI Foam’s position as the leader in their industry. J.S. Steel Fabricators & Welding Inc.